In the last post we looked at the twenty year returns of Imperial Brands – one of the two big FTSE 100 tobacco firms. You’ll recall that despite the huge change in attitudes toward smoking and tobacco investing the stock still managed to return double digit annual share price appreciation since 1997. That’s solely capital growth too. Once you add in the annual returns from dividends then any investor holding over that period would now be looking at £16.50 for every £1 originally invested in the stock. Not too shabby for a company whose business is in structural decline. To understand the driving force behind that kind of performance you only really have to consider two points. The first one is that over the last twenty years there has been a general move towards higher yield investments. Back in 1997 a virtually risk free investment in UK government debt would have produced 7% annual income. If you compare that to the 1.6% you would receive today then you can see why the dividends of a stock like Imperial Brands suddenly look very attractive. The overall result was an expanding earnings multiple which has added 5% to the annual returns over that time frame. Secondly, despite all the negativity surrounding tobacco, the quality of the company’s underlying earnings has remained very strong. Margins are enormous, as is the cashflow which funds dividends and regular share repurchases. In this follow up post let’s take a quick look at how the larger of the two, British American Tobacco (LON: BATS), did over the same period. It stands to reason that, given how high the returns were for Imperial Brands stock, a similar level of performance might be expected from its peer too. After all the company enjoys the same high margins, exceptional pricing power and the kind of strong branding power that comes from popular cigarette labels like Kent, Pall Mall, Dunhill and Lucky Strike. The end result is that the company is a certifiable cash cow. 31% of revenue ends up as free cash flow to fund dividends and buybacks – a virtually identical figure to Imperial Brands. Let’s take a look then at a £15,000 purchase of British American Tobacco stock in April, 1997. Remember that over the same period an investment in Imperial Brands stock would be worth in the region of £185,000 today, with around £63,000 in dividend cash sitting in your broker account assuming no reinvestment along the way. British American Tobacco stock was trading for about £3.75 at the time, so a £15,000 investment would have bought you exactly 4,000 shares. The full year dividend was 26p, equal to a yield of 6.90%. Let’s assume that you were happy to just let the dividend payments build up in your broker account. 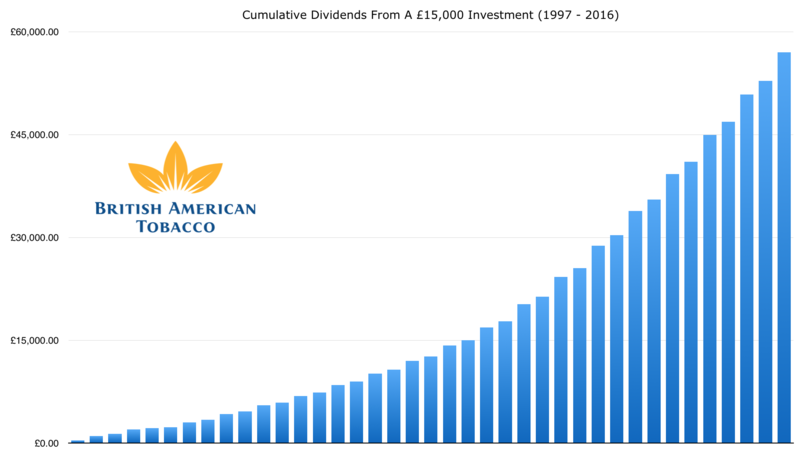 Just like Imperial Brands the cumulative dividends received over that time frame amount to something like four times the initial investment – with a grand total of £57,000 in cash from dividends sitting in your account. The dividend distribution has risen by over 10% annually on average, and the shares would have thrown off £6,160 in dividend income alone last year. As for the capital appreciation, the initial £15,000 capital outlay would be worth £165,800 today courtesy of a current share price of £41.33. Adding up the final figures therefore gives a value of £222,800; made up of £165,800 worth of stock and £57,000 in cumulative dividend cash. That equates to compounded annual returns of around 15% a year, which is roughly similar to what we saw with Imperial Brands. Two different companies – but with remarkably similar underlying quality metrics – produced almost carbon copy results. The reasons behind that incredible performance have already been covered, but what is interesting is that these massive returns were in a period of pretty stagnant organic growth. The actual sales for British American Tobacco have declined by 2.5% every year for the past five years alone. It didn’t matter though because the starting valuation was so low and these super high quality business can create their own “growth”. Earnings per share have risen by 8.5% a year over the same time frame, despite the decline in revenues, because of share buybacks and the enormous amount of pricing power that tobacco companies have. Each and every year these companies have been able to raise their unit prices to a degree that more than offsets volume declines. That, and over 30% conversion of revenue into free cash flow, has allowed the company to return billions of pounds in excess cash via share buybacks. The reducing share count has added over 1% to earnings per-share in each year over the past five years, and that’s during a period of relatively “high” valuation. The effect gets amplified in the times were the earnings multiple is relatively depressed. In all likelihood the next twenty years aren’t going to see the same high returns as the pervious two decades for either of these companies. Even ignoring the continuing headwinds that will affect the tobacco industry, the expanding valuation multiples that have boosted returns are not going to continue acting in their favour. What they do represent though is a great example of how high quality businesses can generate large returns, without the need for huge organic growth. Things may change going forward, but for now that profit engine still remains intact.